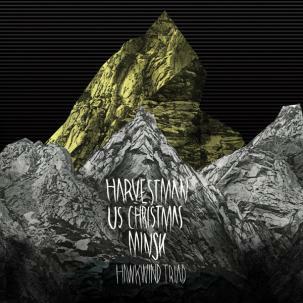 Hawkwind Triad - "Harvestman, Minsk, US Christmas"
Another tribute to Hawkwind has surfaced now and this one is pretty damn cool, heavy and psychedelic. A lot of the versions are very very true to the spirit of the original Hawkwind. The US Christmas versions of Master of the Universe (done slow like the original), Psychedelic Warlords, Orgone Accumulator and You Shouldn't Do That are all really great versions with powerful vocals by Nate and heavy psychedelic head material. Steve Von Till's Harvestman, where he plays everything but the drums, take a bit more liberty with the tracks and D-Rider, Down Thru The Night, The Watcher and Magnu are pretty cool as well. Minsk do very cool versions of 7x7 and Children of the Sun but I really did not like their version of Assault and Battery>Golden Void very much. The vocal was just a bit too forced and screamed. If you like the old school Hawkwind and want to hear some heavy psychedelic versions of some classic songs, don't miss this great CD. US Christmas's versions are my favourite for sure. Good work Neurot.